While I do enjoy baking or putting together bakes and desserts which challenge me, I also love the simplest and the easiest of them. The kinds which are fun, easy and sure to succeed like the endlessly versatile verrines. They are a joy to make as you don’t have to sweat over the finish or fuss over the decoration as you would in a frosted cake. 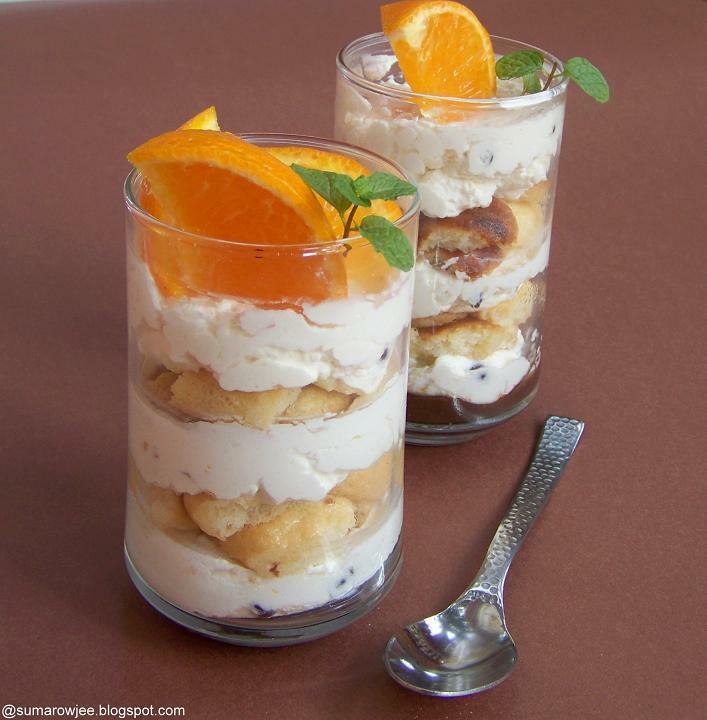 A verrine is a confection originally from France, made by layering ingredients in a verrine (glass). 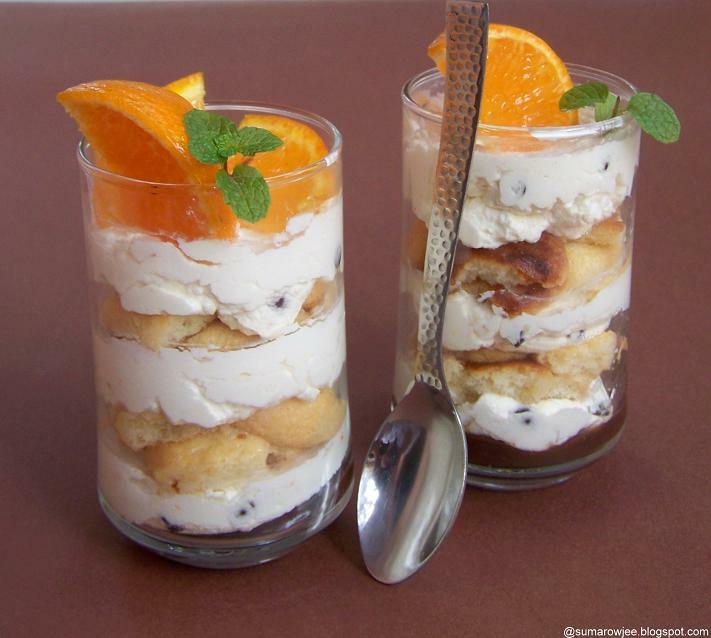 It can be either sweet or savory, making a dessert or snack - Wikipedia. These single serve desserts can easily be personalized for folks with different tastes or just to humor your kids. Made with fatless sponges or ladyfingers, these conveniently benefit from advance preparation, making verrines a hostesses' dream. The best thing about verrines is even bits or odd sized chunks of leftover fatless sponge or just enough broken ladyfingers work just great! Amusing as it may sound, a first attempt at baking a fatless sponge or a genoise have me dissecting it into layers or cubes to see if its baked properly and check if the cake will withstand a good dousing of syrup. And then make a dessert out of it! Go ahead and bake that fatless sponge or some ladyfingers if you haven't yet – you can tear up the cake or break the handful of ladyfingers and still make an impressive dessert out of it – and no one needs to know! I had some ladyfingers in my freezer which I had originally intended to use for making Tiramisu. But since there weren’t enough of them, I ended up baking some more. I had the older batch in my freezer long enough to have me losing sleep over them. 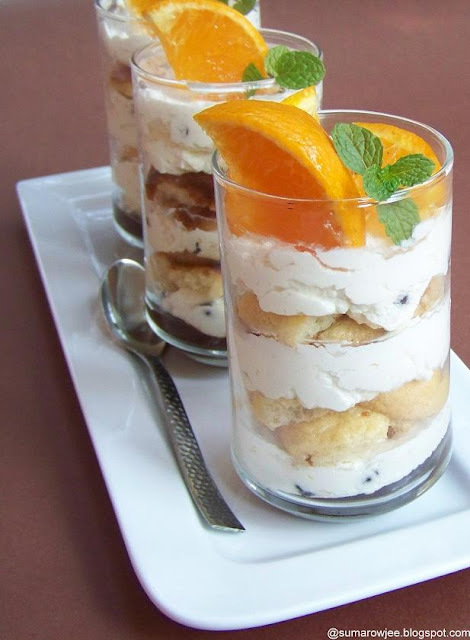 Some leftover whipped cream and mascarpone came in handy and conveniently found their way into these Orange Mascarpone Ladyfinger Verrines – ladyfingers soaked in sweetened orange juice, layered with some zesty mascarpone whipped cream. And just a smidgen of ganache at the bottom of each glass as orange and chocolate make a superb pairing! I must admit, am really partial to fat-less sponges and ladyfingers for use in trifles or any recipe which needs the cake to be brushed or dunked in syrup however briefly. I prefer not to use butter cakes and the kind as they tend to get sort of pasty once soaked. And no, no ready cake from a super-market please! Here is what I did to make 3 tallish glasses. You could take the below recipe ( I know I can hardly call this one!) as approximate quantities . Feel free to tweak and change according to your taste and preference, less fingers more cream, you could use just sweetened whipped cream or cream and mascarpone mixed in any ratio you like, use some ganache or chopped orange segments or toasted chopped walnuts or almonds in the mid layers …As I said, this is just an idea, let the creativity flow! Have your glasses ready. Mix the orange juice, enough water and sugar. I like this tasting orangey, sweetish but not tart. Add a splash of vanilla. Whip the cream and zest together to form soft peaks. (If the cream is beaten to stiffer peaks, it will be difficult to pipe into the glasses, soft cream has more textural appeal too) Take the mascarpone in a medium sized bowl, add powdered sugar to taste (remember that the whipped cream is already sweet) whisk it lightly to break it up if firm. Gently fold it into the whipped cream. Fill in a pastry bag without a nozzle or a large round tip. Spoon some ganache (about 2 teaspoons in each glass) into each glass. Pipe some cream over it. Break the ladyfingers to fit in your glasses. Soak the ladyfingers in the orange juice-water mix briefly (I like my ladyfingers thoroughly moistened) placing them in a layer on top of the cream. Pipe some orange mascarpone cream on top of the lady finger layer. Spoon more ganache and some nuts if using. Repeat with another layer of lady fingers and finally more mascarpone cream. Chill for several hours, a day would be great. Garnish with fresh orange or chocolate curls and nuts just before serving. Enjoy the dessert and the happy sounds of clink-clank-scrape-scrape as you dig into the glasses! Please Note : Alter the quantities of sugar, orange juice and water depending on the sweetness /tartness of the juice. Unless making these with all left over components, its better to have more rather than less of each on hand. Any component left over can be put to another use. Orange zest - Wash the oranges with hot water to get rid of the wax, or you may not get zest good enough. I once made something which tasted faintly of orange though I used a fair amount of zest, thanks to the wax coating. Looks absolutely gorgeous & inviting !!!! This looks absolutely delicious! Am definitely going to try the Savoiardi recipe soon. am drooling here!!!! looks so professional and picture perfect!!! wow..yummy..frst time here..lov ur space..hapi to follow u..glad if u od d same! That looks like a super dessert, Suma ! Very pretty !! 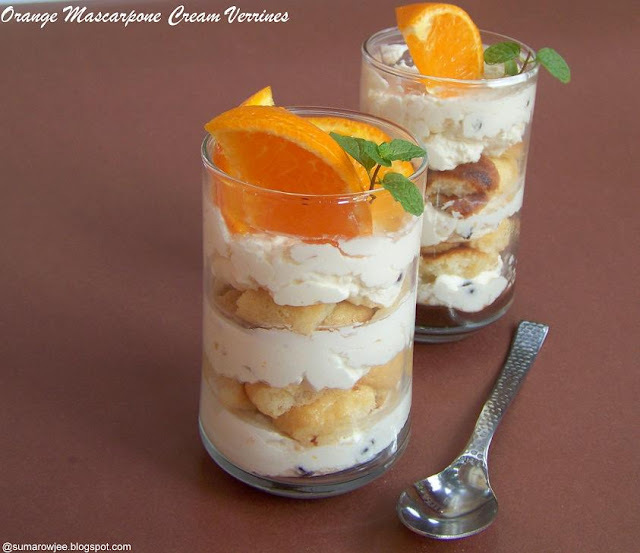 Oh that Orange Mascarpone Cream Ladyfinger Verrines look decadent Suma. I love the way you have presented them in those glasses. They look adorable! Beautifully done, who can resist to this wonderful and delicious verrines. Only 3 words - yum, yum, yum.